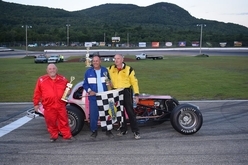 “Thunder in the Mountains” and that just what it was as the Senior Tour Auto Racers rolled into White Mountains Motorsports Park on August 27th. 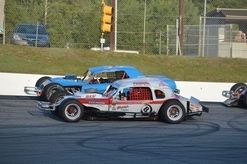 You could hear the echoes of the engines throughout the mountains as these vintage modifieds have a sound of their own! 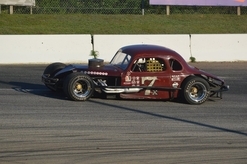 STAR would walk the fans of WMMP back into time with vintage racing at its best! 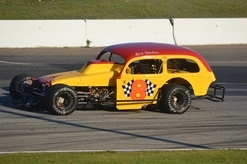 The day started for STAR with warm-ups from 12 to 3, giving both divisions equal time on the track to get their cars ready for heats and features that would follow that night. 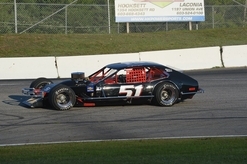 The first to hit the asphalt was the Sportsmen division for their heat race. 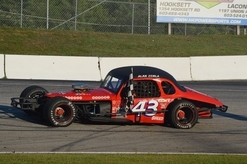 It would be Alan Zemla from Me in his #43 coupe (known as Fred) to take down the first checkered for the evening and the heat win for the Sportsmen division. 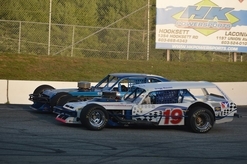 The Modifieds were lined up and ready for their heat race. It was a tight race with positions switching from lap to lap. 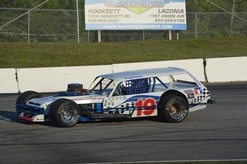 Gregg Massini from Ma in his #19 Vega Wagon made his move and took down the second checkered and the heat win for the Modified division. 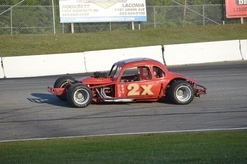 Then it was time for the feature races to take place. 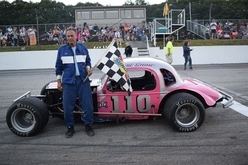 In the Sportsmen division it was Rookie Curt Snow from Ma in is #110 coupe to take the checkered and his first win for the Sportsmen division of STAR. 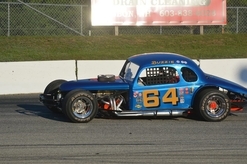 Art Merchant from Ma in his #64 coupe took a second and finishing off the pack with a third was Robert Harless from NY in his #8 sedan. 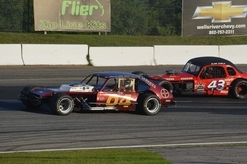 The coupes ruled that night in the Sportsmen division! Top three were brought trackside for an out of car interview and awarded with trophies. 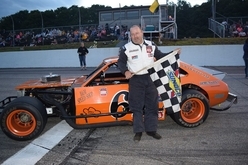 In the Modified division it would be Jocelyn Laliberte from Quebec Canada in his #61QC Pinto to take the checkered and the feature win for the Modifieds and his first win with the STAR tour. 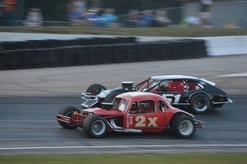 Charlie Lima from Ma in his #2X coupe and Tom Beauregard from Ct in his #51 Pinto battled for second. 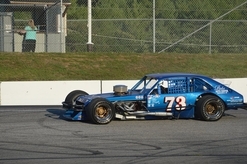 When the checkered came down it was Lima to pick up a second and Beauregard finished off with a third. 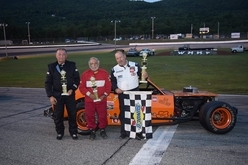 Top three were brought trackside for an out of car interview and awarded with trophies. 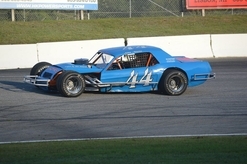 It was great to see in both divisions with first time winners in “Victory Lane”. Congratulations Guys job well done! 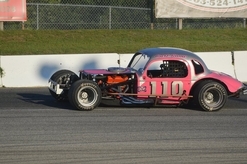 STAR would like to thank White Mountains Motorsports Park and their entire staff for all their hospitality and a great day and night at WMMP! See you next year!